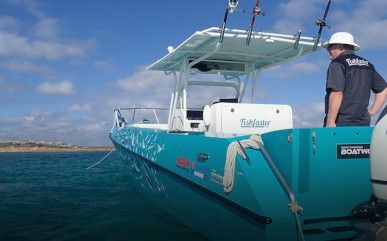 Our 33′ center console, designed by Robert Scholfeld, is an awesome machine. The current boat is powered by a pair of Suzuki 350 outboards and has a top speed of 60 knots but more importantly with a full load at 30 knots it burns 20 gallons per hour. Built to the most recent USCG Sub Chapter T passenger boat regulations this would make an excellent Charter Fishing Boat. It’s optimized structure means that it is light and strong with extraordinary sea keeping ability. Not only is welded aluminum plate boats last a life time, are repairable, we can customize the interior to fit your needs – we are not constrained by a mold.